New tire labels roll into European shops, but will they make it to the U.S.? You've reduced costs, improved profitability, satisfied your customers, and even made your employees happier. So what? By John Shook, chairman and CEO, Lean Enterprise Institute. The U.S. Army is preparing to conduct a second Forward Operational Assessment of its XM25 Counter Defilade Target Engagement airburst weapon system. The hand-held weapon fires a high-explosive airburst round capable of detonating at a specific, pre-determined point in space near an enemy target hidden or otherwise obscured by terrain or other obstacles. MIT researchers have found that lubricated, nanotextured surfaces improve the performance of condensers in power and desalination plants. With this new treatment, "drops can glide on the surface," floating like pucks on an air-hockey table and looking like hovering UFOs. NASA's Supersonics Project embarked on its latest effort to soften sonic booms recently when a NASA F/A-18 aircraft took to the air in a project called Farfield Investigation of No Boom Threshold, or FaINT. The newest Loctite Instant Adhesives from Henkel maintain their bond strength in operating temps as high as 250 degrees F, yet they fix in just 15 sec or less. 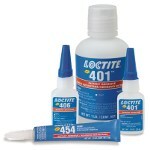 Loctite 401, 406, 495, and 454 surface-insensitive instant adhesives are designed to meet the needs of high-speed assembly processes. They cure rapidly on dry or acidic surfaces and in low-humidity environments, and they bond reliably to a wide variety of substrates including steel, aluminum, ABS, PVC, polycarbonate, nitrile rubber, chromate-plated parts, paper, balsa wood, and more. Steven Gauthier, P.E., Dexter Magnetic Technologies, explains how non-contact linear and rotary position measurement is attainable with robust multipole magnets. Pepperl+Fuchs introduces G11 passive splitters to its family of G11 Series AS-Interface I/O Modules. 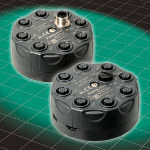 Available in flat cable or M12 male connector versions, these splitters are sealed to keep out contaminants. They are also ECOLAB certified and IP67 rated for reliable operation in wet environments. In addition to AS-Interface, they are well suited for any power or network distribution requirement. 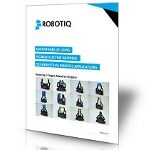 ROBOTIQ has a new eBook out that answers frequently asked questions about its incredibly cool 2-Finger Adaptive Gripper. Learn about how to control the gripper, create a faster cycle time, use gripper feedback, and verify the gripper contact during a process. There's a good video on this site, too. Crouzet has introduced the whisper-quiet (literally!) DCmind Brush range of direct current brush motors. 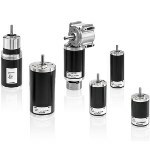 The new product range includes 15-, 25-, and 55-W motors with a 42-mm diameter, and 55- and 104-W motors with a 63-mm diameter. DCmind Brush motors support 12-, 24-, and 48-V power supplies and offer exceptional efficiencies even under full load, long service life, and a wide range of gearboxes and accessories. This series is particularly well suited to applications in medical, laboratory, industrial, and high-performance printing industries. They can also be used in a variety of other applications such as pumps and valves, railways, and aeronautics. GEOMATE has added 3 hours of no-cost eLearning materials to its website to enable users to learn to apply GrafiCalc for solving product innovation challenges. 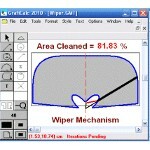 GrafiCalc is a mechanical design calculation software that seamlessly combines the disciplines of sketching, calculations, motion simulation, backsolving, data collection, and statistical tolerance analysis in a single application. The training is divided into 21 clips, and users can learn to automate design calculations, goalseek geometry, solve linkages and mechanism design challenges, analyze tolerances, validate producibility, and a whole lot more. Look for the eLearning tab at the top of the GEOMATE website. When designing the RDASS 4 helicopter UAV for the military, Leptron engineers faced the challenge of developing eight variations of complex fuselage components in a short period of time to beat potential competitors to market. DARPA completes close-proximity flight tests of two modified RQ-4 Global Hawk unmanned aerial vehicles to demonstrate technology enabling autonomous aerial refueling. A group of researchers at Penn's School of Engineering has discovered a new way of combining the structural color and superhydrophobicity found in butterfly wings. Real-world applications abound. 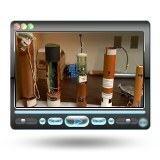 What's inside a hurricane-monitoring dropsonde? Inside a cylinder that is about the size of a roll of paper towels lives a circuit board filled with sensors. It's called a dropsonde, or "sonde" for short. It's a workhorse of hurricane forecasting, dropping out of "hurricane hunter" airplanes right into raging storms. As the sonde falls through the air, its sensors gather data about the atmosphere to help us better understand climate and other atmospheric conditions. The National Center for Atmospheric Research (NCAR) has been designing, building, and improving dropsonde technology for more than 30 years. Are your engineers using the right tools for 3D? SpaceClaim 2012+ introduces significant new capabilities for manufacturing, simulation, concept development, and mesh remodeling. These enhancements will help all engineers work more effectively in 3D, without the high cost and complexity of traditional CAD. SpaceClaim wants every engineer to work in 3D without having to be a CAD expert.